When you earn this badge, you'll get to see what an adventure camping is! You'll get to play in nature, eat outside, and sleep under the stars with your family, buddies from your troop, or other friends. 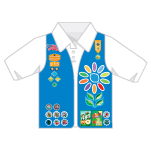 When you’ve earned this badge, you’ll know how to go camping—at a campsite or in a back yard—with your family or friends.